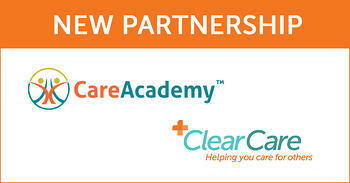 BOSTON and SAN FRANCISCO, April 2nd, 2019 -- CareAcademy, the leading mobile caregiver training platform, today announced a Preferred Partnership and integration relationship with ClearCare, the leading web-based and mobile operating platform for home care agencies. The companies will work together to integrate their core platforms to empower home care agencies to provide just-in-time learning about client needs and state-approved compliance training. "Our partnership with ClearCare signals a first in the growing and ever important home care industry, and drives value for both home care agencies and caregivers," said Helen Adeosun, CareAcademy Co-Founder and CEO. "CareAcademy and ClearCare’s integration means that agency owners can make sure that caregivers can get to work faster and focus on meeting the needs of the clients by streamlining home care training." "Our partnership with CareAcademy makes it easier and more efficient for home care owners to ensure caregivers not only experience more engaging classes but ultimately are better trained," said Ed Chuang, Vice President of Marketing at ClearCare. "A huge benefit of the CareAcademy platform is the insight and phenomenal support CareAcademy provides home care agencies. CareAcademy will be a powerful addition to ClearCare’s ecosystem for agencies."